In response to my previous articles here and here, not to mention the disaster story here, I've had a few queries about my hand pump. I suppose I shouldn't be surprised – there’s obviously a fair bit of interest in alternative ways of filling up. The reasons vary – for some it's a matter of availability because they don't have a forecourt locally, for others it’s a matter of cost. Whatever the reason, here is a distillation of what I’ve told those who've enquired. So what sort of questions have I been asked ? Well mostly they've been about the construction, and in particular, where certain bits came from. The most common question has been about the fittings I used. I short, I went into my local hydraulics/airline place (Hydracentre, with an online shop) and asked what they had - the guy was fairly helpful and offered me the bits I used. Looking through the book, the CV100 range may be more suitable, rated for 360psi and a quoted opening pressure of only 20"WG (about 0.8psi). There's a VFU range which has a choice of Viton or EDPM seals and rated for 145psi. And then a few pages on, the Roma IT104 range is described as "suitable for use with gasoline and fuels in general too", and being rated for 360psi would seem to be just the ticket. Might need to remove some springs as it doesn't say what the opening pressure is and the image shows it being a double check valve. Whatever you use, you'll probably have to remove the springs from the inlet valves as it only takes a tiny drop in pressure to make the gas vapourise. That brings me to one thing I'd do differently. From the pictures you'll see I fitted all the valves in the top of the cylinder - the smaller ports were originally for a stroke end damper built into the cylinder, but I removed the tapered screw and drilled/tapped the ports out to 1/4" BSP. That means gravity will naturally hold the inlet valves open which is not what you want. If you pump slowly, the valves stay open and you just recirculate gas from one end to the other ! It needs a quick jerk on the lever to pop the valve up and then the pressure holds it shut. Doing it again, I'd put the ports on the side, and use tee pieces from a single port in the cylinder. Inlet from below, outlet to above, so the inlet valves would naturally fall shut under gravity. The downside is that the overall height of the valve assemblies and associated fittings would be considerable. I also considered using a couple of aluminium blocks and machining a couple of valves in them which could be more compact, plus have the two link pipes between them as rigid tube sealed with an O-ring at each end. 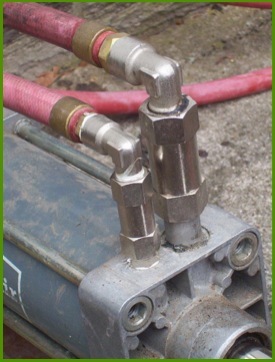 There are some commercially made LPG hand pumps which are effectively like that with the valves built into the cylinder end caps. The hose is simply some medium pressure fuel hose they had in stock - printed with “Propane” and rated for 20 bar, so plenty strong enough. As previously stated I fitted the small brass ball valve so as to be able to keep the cylinder from de-pressurising every time I disconnected it. The valve is essential on the fill side where I removed the shutoff valve from the coupling, but on the supply (vehicle) end it's probably not required as the airline coupling has a valve built in. The couplings are just standard airline couplings - but different to what I use on the airline ! This could be one of the hardest bits to deal with. 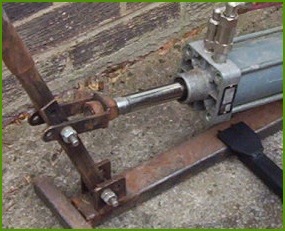 When I built my hand pump I went to a local outfit and they sold me the POL fittings (nut and tail to fit a propane bottle), but they've since stopped selling them on health and safety grounds - “elf–n–safety” strikes again What you need is a “bottle tail and nut”, with a left hand nut as it’s a fuel gas bottle. For the vehicle end, you may have to buy an adapter and modify it to allow you to screw in a standard pipe threaded fitting. I made mine from a large bolt, cutting the thread to match the adapter I used to fill the Discovery from UK pumps. I believe it is, like the bottle nut, a 9/16" BSP thread (right hand this time), and so a right hand htreaded bottle nut may fit – but this is something I have not tried. WARNING – you may think that a 1/2" BSP fitting fits the vehicle filler. It “almost fits” and to an untrained eye may seem OK, but it's actually somewhat smaller than the female thread and only a tiny amount of thread is actually holding the two together. I think the risk is should be fairly obvious. If anyone knows of a source for suitable fittings then I’ll be happy to add it here. After non-return valves, this is the other area that gets the most questions. To start with, my cylinder is 100mm diamter by 100mm stroke (4" by 4" in old money), and with the lever I use (about 4'6" from pivot to end) is reasonably comfortable to use. Size really does matter ! This is an area where there is plenty of scope for experimentation and tradeoff. The 4x4 cylinder I’ve used suits me as I have enough corpulence to just lean back and forth to work it – someone of lighter build could well struggle. If you look closely you may be able to see that I made the metalwork with several sets of holes (two in the piston end bracket, two in the bottom pivot, and three in the lever) as I didn't have any experience to start from and wanted some scope for adjustment. As I use it now, the lever is 56" from bottom pivot to the top (about 4"6" (137cm) to where you'd grip it), and 6½" (165mm) from bottom pivot to cylinder attachment. That gives a lever ratio of about 8.3:1 - and means that for every pound of force you apply to the lever end, it applies about 8.3 pounds to the cylinder. It also means that the lever moves through about 36˚, and the movement at the end is about 33" (84cm). a smaller cylinder diameter (ie smaller area) will mean lower forces (less effort) but less volume per stroke. a shorter stroke will keep the forces the same, but reduce both the movement of the lever arm and the volume per stroke. a shorter lever will mean less movement during pumping, but require a proportionately larger force. a shorter bottom pivot to piston attachment distance will mean less force on the lever but more movement. Obviously it's more likely that you would alter more than one of these dimentions, and these would interact – so if you reduced the cylinder area by half, but doubled it's stroke, and attached it 13" up the lever then you'd get the same volume per stroke and use about the same force over the same amount of lever movement. One reader had his eye on a 80mm diameter by 250mm stroke cylinder. My response was that it's about ⅔ the area of my cylinder, so to keep everything the same it would want to be about 1½ times the stroke (or about 150mm). Moving the piston attachment up to about 9¾" (6½" x 1.5, 248mm) would give about the same forces required, but the stroke would be somewhat longer at around 55" (33" x 250/150, 140cm) which from experience I think would be uncomfortable to use. Another reader had his eye on an 80mm diameter by 100mm stroke cylinder, and that would probably be about the size I’d pick if I were starting again from scratch. It's about ⅔ the area and the same stroke – so with some small adjustments to the lever dimensions I’d have something requiring a little less force and a shorter stroke, but still a reasonable volume per stroke. So using a large cylinder means you either have a very long stroke, or have to use lots of force, neither of which would be very comfortable to use. On the other hand, a small cylinder would result in short strokes/light pressue, but require a lot more strokes - but on the other hand, would be physically smaller and more portable. So there you are, that's about it on construction. Apart from construction, I’ve had a few questions on using a hand or electric pump. When filling up and it gets to maximum fill how do you know to stop pumping ? Basically, it all goes stiff and you can’t move the lever any more. At around 80% full, the automatic shutoff valve will trigger and stop you filling – though on some designs, you may be able to squeeze a little more in very slowly. After filling what do you do with the lpg left in the hoses and the cylinder ( does it need to be vented or is there a way to pump it back into the LPG cylinder) ? With the valves I have fitted, you just close the valves and leave the remaining gas/liquid in the pump. Before I built my own, I borrowed one someone else had made and with that you had to ‘crack off’ (ie loosen until it doesn't seal) a connection and wait while the contents of the pipes and cylinder boiled away. How many fills do you get from a cylinder ? Work it out ! A big red cylinder is typically 47kg, or 94 litres, divide that by your typical fill and you have your answer. For a small tank you may get two or three fills from a cylinder, for a big tank you may need more than one cylinder to fill it. For my setup, and a moderately gentle workout, about 20 minutes for almost a full cylinder. Add another 10 minutes setup and pack away, and you've got half an hour for a fill with large tanks. Adjust your times according to your tank size and how organised you are at packing your kit away. I hope that answers most questions.